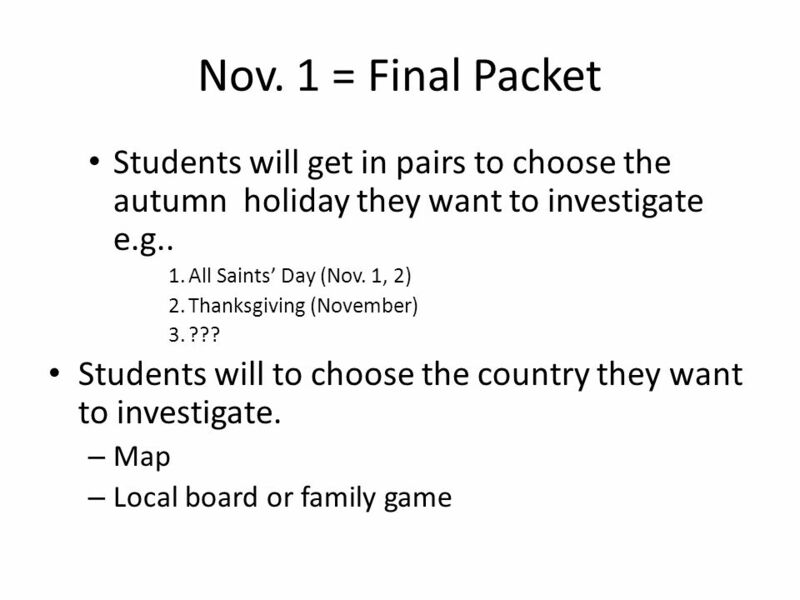 Fall Celebrations Around the World Pre AP & SPN AP Nov. 1 = Final Packet Due=Test grade. 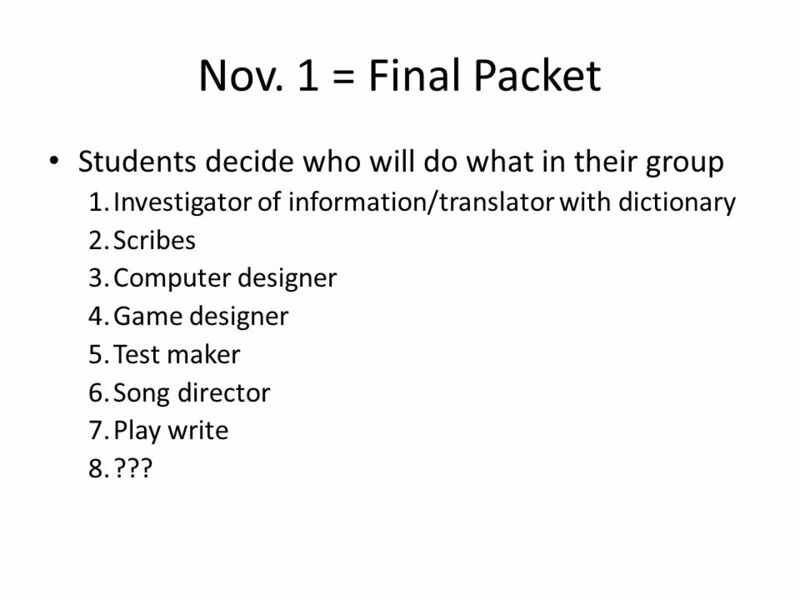 3 Nov. 1 = Final Packet Students decide who will do what in their group 1.Investigator of information/translator with dictionary 2.Scribes 3.Computer designer 4.Game designer 5.Test maker 6.Song director 7.Play write 8.??? 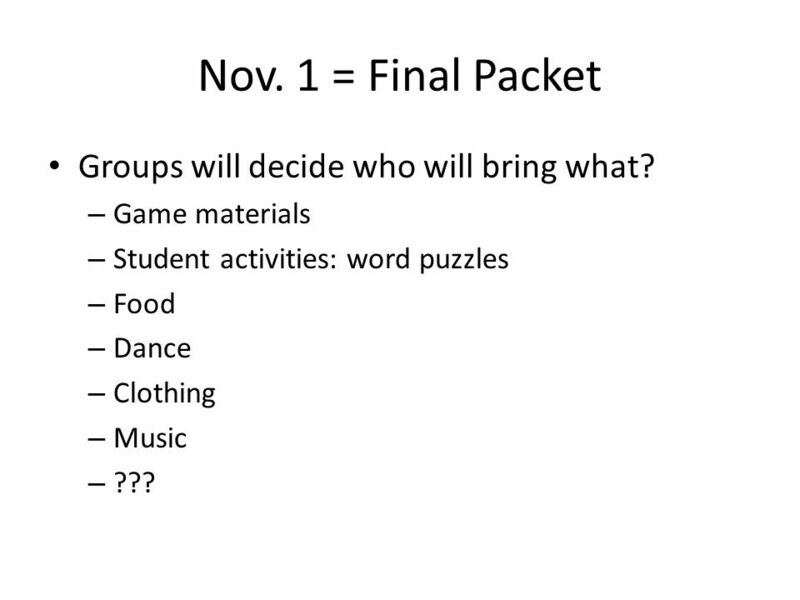 4 Nov. 1 = Final Packet Groups will decide who will bring what? – Game materials – Student activities: word puzzles – Food – Dance – Clothing – Music – ??? 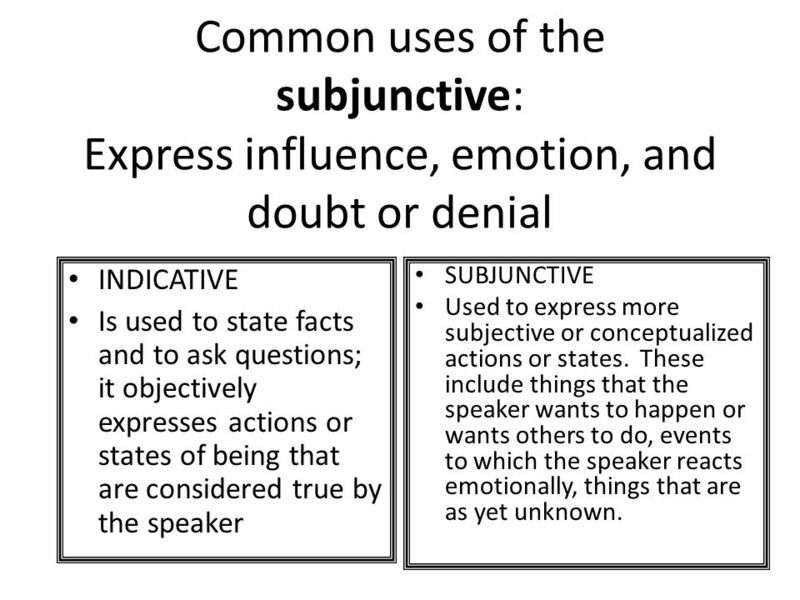 6 Common uses of the subjunctive: Express influence, emotion, and doubt or denial INDICATIVE Is used to state facts and to ask questions; it objectively expresses actions or states of being that are considered true by the speaker SUBJUNCTIVE Used to express more subjective or conceptualized actions or states. These include things that the speaker wants to happen or wants others to do, events to which the speaker reacts emotionally, things that are as yet unknown. 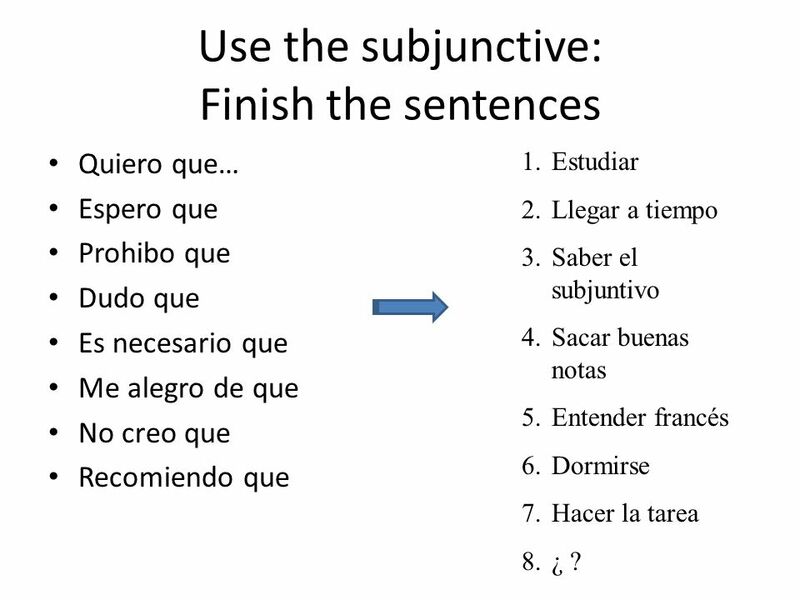 9 Use the subjunctive: Finish the sentences Quiero que… Espero que Prohibo que Dudo que Es necesario que Me alegro de que No creo que Recomiendo que 1.Estudiar 2.Llegar a tiempo 3.Saber el subjuntivo 4.Sacar buenas notas 5.Entender francés 6.Dormirse 7.Hacer la tarea 8.¿ ? 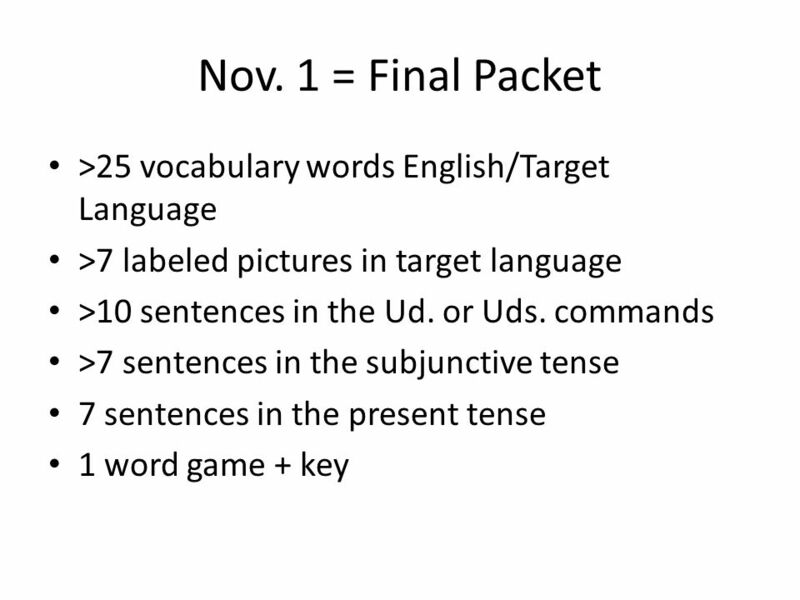 Download ppt "Fall Celebrations Around the World Pre AP & SPN AP Nov. 1 = Final Packet Due=Test grade." 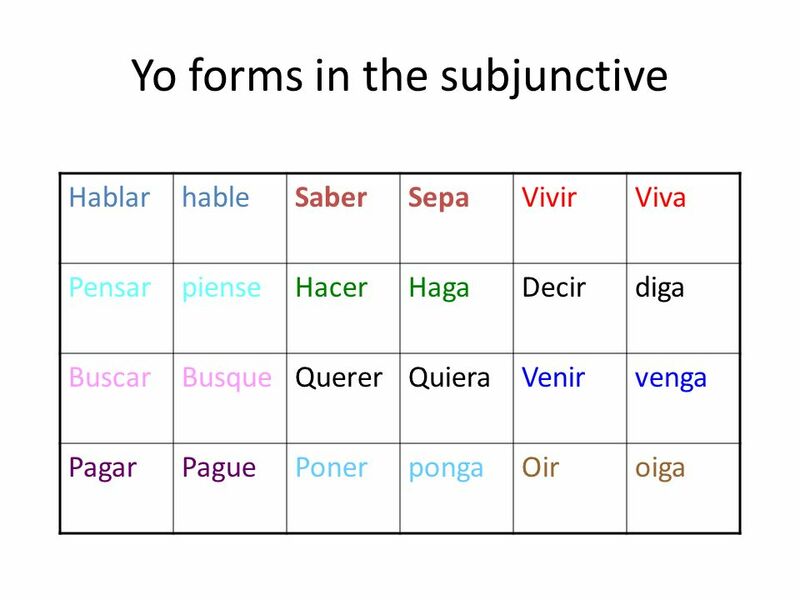 Conjugating Verbs in the Subjunctive. 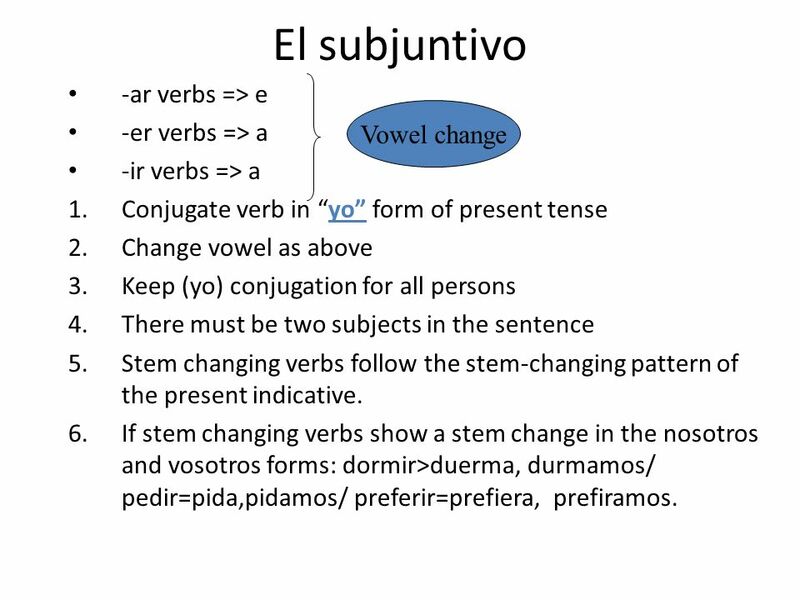 The Subjunctive Tense 1.The subjunctive tense is used to express either a direct or an indirect command. 2. The. - IR STEM CHANGERS IN THE PRESENT SUBJUNCTIVE MOOD. Actividad Inicial Turn in your mini poster to the tray. Hoy es lunes, el 13 de marzo de Yo puedo… Conjugate –er/-ir verbs to express what people do in a restaruant. Create sentences using infinitives.